Norcraft is one of the more popular choices my customers select because of its selection and price point. You can purchase cabinets that cost more and cost less... Some features of a cabinet may or may not appeal to your specific situation. In addition to checking out the information and video below, you may also want to read CABINETS OK GOOD BETTER BEST. Painted cabinets are very popular these days. 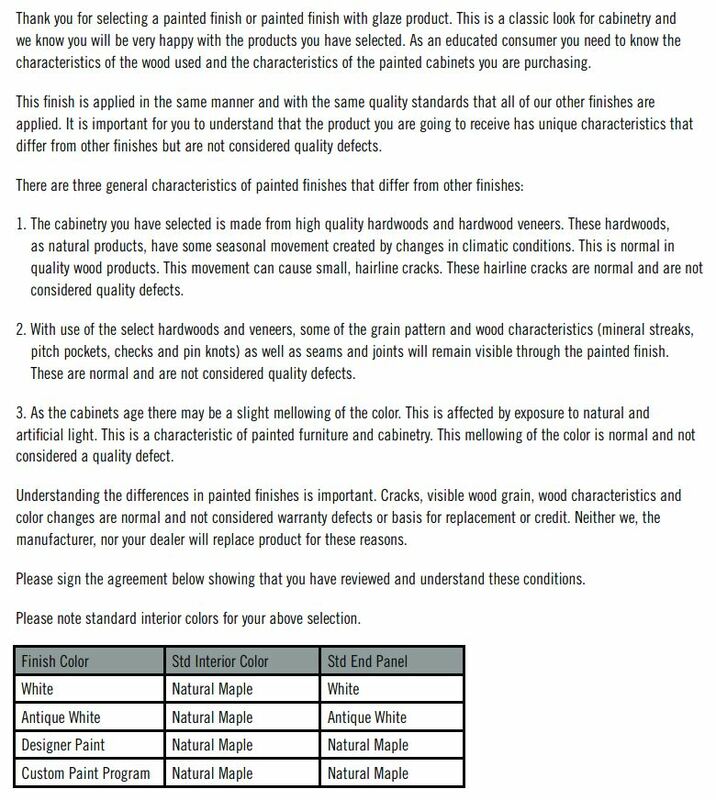 Cabinet manufacturers will require customers to understand and often sign "Paint Awareness" forms when a cabinet order is placed. CLICK HERE to see Norcraft's paint awareness form language. Keep in mind this does not apply to stained finishes. Depending on the cabinet manufacturer, there may be other "educational" type forms you should have a look at prior to ordering cabinetry. Be sure to ask what other forms, if any, apply to your kitchen or bathroom remodeling order. Have a look at the video below. If you would still like to see the cabinetry you are considering in person let us know. It is very important to the Kitchen Gallery that customers understand what they will be receiving. If there is anything we can clarify, please ask. A few comments about cabinet delivery... All Kitchen Gallery estimates for cabinetry will include the cost of delivery to the Kitchen Gallery in North Hampton. If you would like your cabinets delivered to the job site there will likely be an additional charge. Generally, if the Kitchen Gallery is installing your cabinets, job site delivery is included in the install price. Otherwise, the fee for job site delivery from the cabinet manufacturer is between $200 and $300. Job site delivery may add a week to your anticipated delivery date.